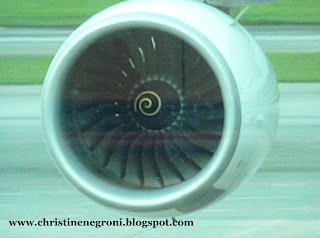 The engine stops whining when the plane is parked at the gate. Just because airline pilots are prone to complain, doesn't mean that sometimes they don't have a legitimate beef. When it comes to the merger of American Airlines and TWA 10 years ago, a federal jury has determined that the TWA pilots were indeed done wrong by their union, the Air Line Pilots Association. Just how the union sold its members down the river is described in court documents. But in brief, the TWA pilots claimed that ALPA betrayed them by promising not to fight American Airline's in-house union, the Allied Pilots Association, even though APA was insisting all the TWA pilots must go to the bottom of the seniority list. "Why would ALPA do this?" you might ask. Because it was hoping that when the dust settled, APA would mosey on over and rejoin ALPA, which it had left in 1963. The eleven thousand American pilots would have been an eye-popping infusion of new dues-paying members. Lee Seham an expert who testified in the case put it this way, "ALPA would be motivated to avoid the alienation of APA - the future prize - by minimizing the advocacy of TWA pilots." There were more than 2,200 TWA pilots at the time American agreed to buy out the financially troubled aviation pioneer, once owned by Howard Hughes . If the TWA pilots went to the bottom of the senority list, they would be the first furloughed if things in the industry went bad. After September 11 things went very bad indeed and 1,200 of the former TWA pilots lost their jobs. Alan Altman, now employed by JetBlue was one of them. 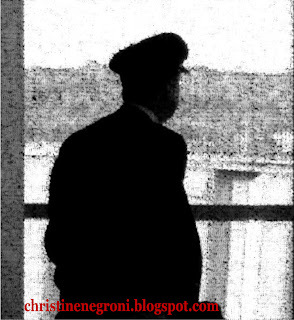 He had been a first officer at TWA on the B767 at the time of the merger. When the TWA pilots found themselves far below new hires at American, and getting laid off while junior American pilots continued to fly, Alan said it was "a horrible experience," pointing out the irony of TWA's long standing involvement with the eighty year old union. 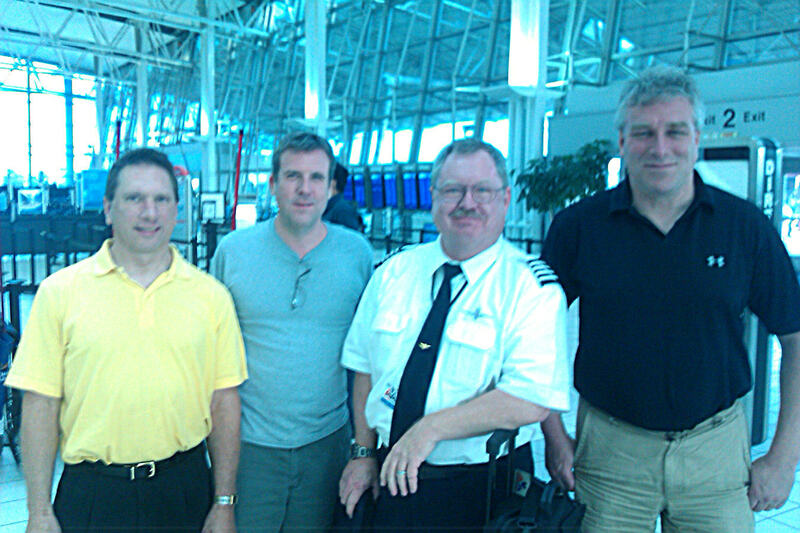 "Here we are, a founding member of ALPA and when we needed them, they turned their backs on us." I sent emails to ALPA's spokeswoman and the union's lawyer Steven Fram, but neither replied to my questions. From what I can cull from their filings in the lawsuit though, the union's defense was that TWA pilots needed to take a glass-is-half-full approach to their situation with APA. ALPA claimed that if the pilots hadn't accepted the my-way-or-the-highway stance of APA the entire merger would have gone down the drain. 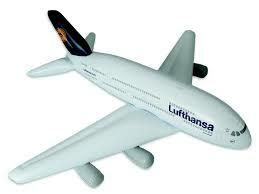 Without American willing to pick up the shreds of the battered airline, it would have gone out of business. Where would TWA pilots have been then? Nope, it is not a pretty picture this view of a union more obsessed with its own coffers than the survival of two thousand of its members - not a flattering look at APA either with its its take-it-or-leave-it intransigence. But its the TWA pilots who are having the next-to-the-last laugh now. Last Wednesday, lawyers Allen Press and Joe Jacobson returned to St. Louis from New Jersey where the jury handed them their victory. They were greeted at the airport by some of the pilots they represent. Alan Altman described the mood as "unbelievable" and "amazing" before concluding, "I can't even describe the feeling." It may feel good to have a jury confirm that an injustice has been done. But it doesn't put a dime into the pockets of the pilots. That won't happen until lawyers begin the complicated process of calculating - pilot by pilot - what each might have made if some more equitable form of integration had taken place back in 2000. Allen Press won't name a sum, but suggests the financial harm to his clients has been "huge." Having worked for a while with trial lawyers, I'm guessing Press will likely ask the court for many millions and just as likely it will be years before the final sum is determined and the case is closed. But there is no reason for other airlines, with mergers in the wings, not to pay attention to what a jury has unanimously determined to be unfair and keep that firmly in mind when its time to integrate their own pilot groups. ....and people wonder why I would never become a professional pilot. The low pay is one and having to pay dues to an organization that doesn't even back it's members up when they are at risk is the other big one. I am Happy, very happy for TWA Pilots! The Airline employee's in this country, for over the last 25 years, have been under financial assault. All this, without the help of a Merger or a CEO filing Bankruptcy. They have willingly gave up much in Pay and Health care, to keep their Airline afloat. Although this TWA issue is different from Eastern Airlines, it is still a victory. Eastern's CEO was told at the Bankruptcy hearing, by Judge Lifland, "I hope you never run another Airline". What does that say??? Many folks like to blame "Labor", but let me tell you, it is not the Airline CEO who is meeting you at the door of the plane, or who will be evacuating you in an emergency. I had a meeting with Senator Bill Nelson's office in Coral Gables, Miami in September 2009. Present were 6 Flight Attendants, from Eastern, all with over 25 years as a F/A. Should be each getting at least $1000.00 a month. Well, one is getting a whopping $243.00 a month. 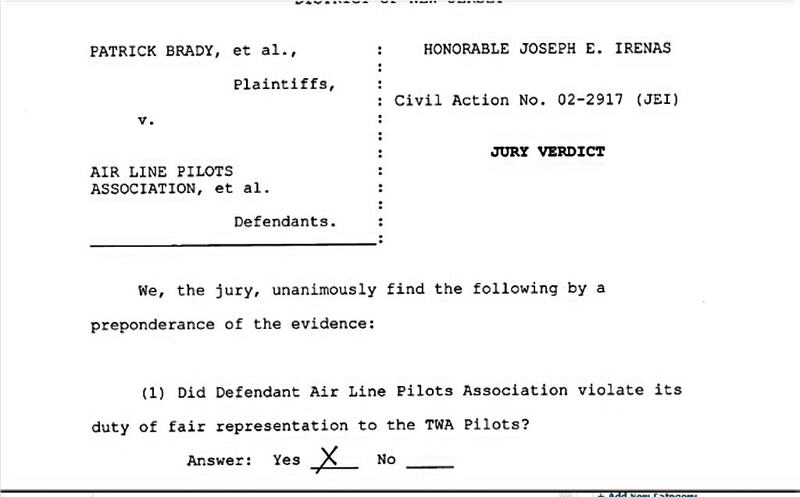 The TWA Pilots were smart enough to get Attorneys. God forbid you talk with your Senator or Congressman for justice. It will fall on deaf ears. Former Congressman Norman Minetta gave me 30 minutes on the phone about two years ago. He agreed that Laws need to be changed for Eastern folks to get their entire,earned pensions.That is all it will take. For Justice. So far, neither Congress or the Senate want to help. For the last 6 years, we have reached out to them for help. Nothing. God Bless TWA and the good Attorney's they had. And a Human jury. This article says TWA pilots were stapled. Wasn't there an integration of the top 500+ pilots prior to any staple? So yes, many were stapled but no all. Why do people bend the facts when writing articles? Sorry but the way I see it TWA was run into the ground by it's executives. AA laid of 1200 of the 2200 TWA pilots it took on. That is 1000 pilots that kept their jobs. If AA did not pick up the pieces no pilot from TWA would have a job, as TWA would have just shut down alltogether. AA executives were stupid for buying what was left of TWA. Old planes, unprofitable routes, and bitter employees which had a right to be bitter. TWA added billions in debt to AA and now AA is struggling to survive. AA would be in a lot better financial health if they would not have purchased TWA. Don't believe me what is left of TWA at AA? A few old Super 80s, but the routes, the majority of its aircraft, it's maintanence base are all gone and AA is left with about a 3 billion dollar hole for the experiment and nothing to show for it. The sad part is that the commenters still don't have the facts straight. TWA had about a week of cash left when AA bought them. Some dispute the time line but it was not much. That's correct it was not a merger of equals but one strong airline buying what was left of a weak almost once again bankrupt airline. The employees that did keep their jobs got health benefits and pension benefits that would have been gone when they went bankrupt again. For the pilots that stayed in St. Louis, the TWA base, they maintained their relative seniority and actually got more and better flying due to the "CC" agreement with APA at the expense of flying at other AA bases. They may have got screwed by ALPA but not by APA. "They may have got screwed by ALPA but not APA"
That quite simply IS the bottom line and what the litigation entailed. Extraneous comments as to personal issues, relative airline strengths and historical truths are mere acrimony. The suit was to determine weather a group of individuals paying substantial dues to an entity remunerated to represent their best interests did indeed do so. At present, a jury decided unanimously that TWA pilots were not fairly represented by ALPA. Again, that is the only issue. Yes, the other points are beside the main Issue. This is all about ALPA looking out for its own interest at the expense of the paying members. ALPA is slowly becoming irrelevant. If the Delta pilots are able to muster the votes for an independent union then ALPA is over. What is the ALPA stance on scope? No one knows. And how about the 1,500 hour rule? It changes month to month but the last published position was that they were for allowing 750 hour of classroom experience to substitute for half the flying experience. Where does the membership stand on this issue and does ALPA National even care? How about the age 65 rule? How long has ALPA been working on CrewPass now? How many more years are we going to have to have "CrewPass Now" stickers on our flight cases? ALPA national is only a self serving organization that even tried to bust their own administrative union to feed itself. What kind of union tries to bust the union of their own workers? I don't see ALPA being around much longer. How is ALPA going to pay for this lawsuit? I worked for two ALPA carriers as well as American......My first airline was Cascade, a small regional in the Northwest, one of the first regionals to go to ALPA in 1981, I believe. We were Teamsters before then. We paid our dues AND Continental assessments until we went belly up in 1986. The only support we got from ALPA was a statement from their lawyer that "We'd be lucky to see a couple cents on the dollar" on back wages, etc. My next carrier was Air Cal which was bought by American in 1987. The "A" scale got date of hire less 42 days. "B" scale like me got ratioed in at 1 to 13 American guys. I was a relative new hire and lost six more months of seniority. Not the fairest, but not as bad as it could have been. ALPA could have done a better job of integration. I winced when American swallowed up Reno Air and it's pilots....most of whom were refugees from Eastern and Midway. They kept their jobs....at the bottom of the list. How many times can you get recycled? I am a lawyer doing research for an article on the TWA Pilots/ALPA litigation. In particular, I am interested in facts beyond what is in the trial testimony. 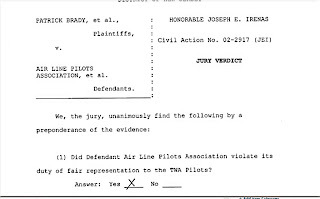 I would be interested in receiving information as to who made critical decisions in connection with this case, which lawyers were "calling the shots" and whether any of those lawyers and/or officers/Board members of ALPA should be held accountable for the result.